In 2009, the North Pacific Fishery Management Council approved, and the National Marine Fisheries Service (NMFS) implemented, a new Fishery Management Plan for Fish Resources of the Arctic Management Area (Arctic FMP). The Council’s action recognizes the different and changing ecological conditions of the Arctic, including warming trends in ocean temperatures, the loss of seasonal ice cover, and the potential long term effects from these changes on the Arctic marine ecosystem. More prolonged ice-free seasons coupled with warming waters and changing ranges of fish species could together create conditions that could lead to commercial fishery development in the U.S. Arctic Exclusive Economic Zone (EEZ). The emergence of unregulated, or inadequately regulated, commercial fisheries in the Arctic EEZ off Alaska could have adverse effects on the sensitive ecosystem and marine resources of this area, including fish, fish habitat, and non-fish species that inhabit or depend on marine resources of the U.S. Arctic EEZ, and the subsistence way of life of residents of Arctic communities. In August 2009, the Secretary of Commerce approved the North Pacific Fishery Management Council’s Arctic Fishery Management Plan, which prohibited expansion of commercial fishing in U.S. federal waters in the Beaufort and Chukchi Seas. 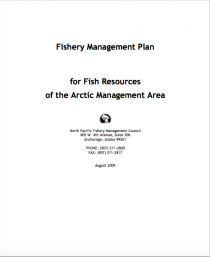 Read the Arctic Fishery Management Plan.